The gravity of the state’s “dairy crisis” cannot be overstated. 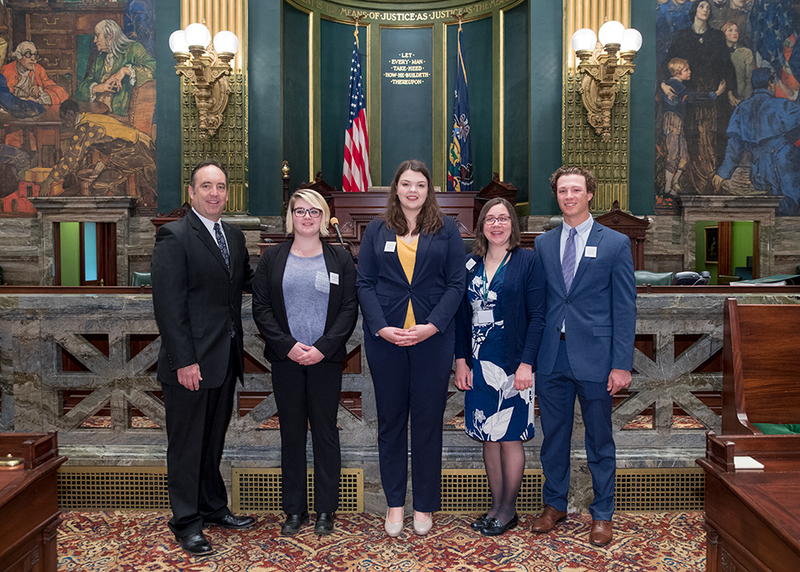 During a presentation to the PA Farm Bureau Tuesday, I called on the Wolf Administration to develop an incentive plan for a dairy processing plant to locate in Pennsylvania. We offer incentives to other companies to locate in Pennsylvania. We need to place the same value on dairy as we do technology and e-commerce. We must do what we can to entice a dairy processing plant back to Pennsylvania. The Wolf Administration released a report in January that said two new dairy processing plants in Pennsylvania could significantly reduce overall supply chain costs and enhance the marginal value of milk for producers while adding jobs and more than $1 billion in economic activity to the state. The Governor said he has written letters asking processing plants to locate in the Commonwealth, but more aggressive action needs to be taken. We need to make dairy farming and agriculture a priority. 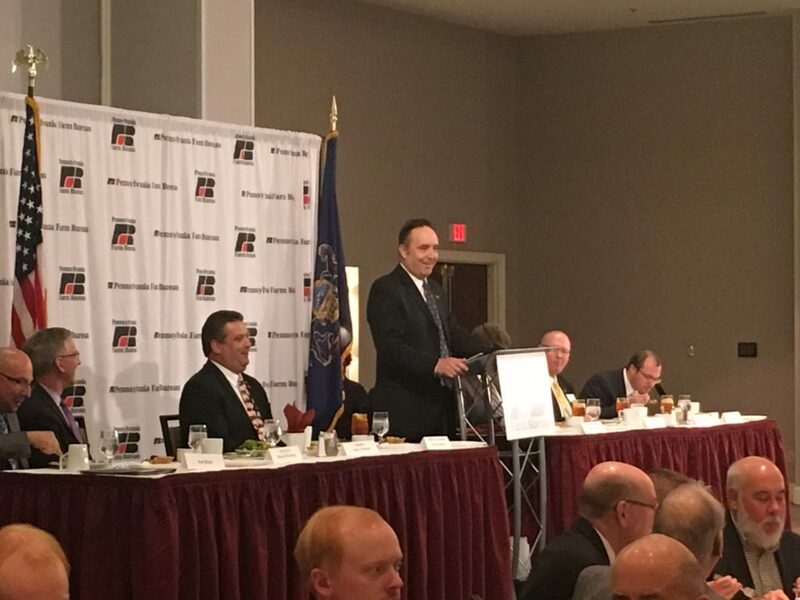 It’s nice to talk about supporting the agriculture community in Pennsylvania. But we need to take action that will attract a processing facility to locate here in order to help our farmers all while stimulating our local economies. Pennsylvania is fifth in the nation for milk production. Dairy farmers face low prices for milk, increasing production costs and a market where supply outpaces demand. Dairy prices have decreased 40 percent from about $25 per hundredweight in milk in 2014 (100 pounds or 11.6 gallons of milk) to about $15 currently. On Wednesday, the Senate unanimously approved my wide-ranging antihazing measure that focuses on prevention, enforcement and transparency in order to end hazing. Senate Bill 1090 will now be sent to the House for consideration. The family of Tim Piazza, who died after a February 2017 fraternity pledge event, turned a parent’s worst nightmare into a mission to end hazing. It is my privilege to join them in this fight by comprehensively rewriting the state’s hazing laws. We are hopeful the House will act quickly and join us in taking a stand to prevent death or serious injury due to hazing so that families, such as Tim’s, never experience tragedies like this ever again. We want Pennsylvania’s hazing laws to be a model for the United States. The carefully crafted bill provides law enforcement with the tools they need to fully prosecute those who engage in hazing-related activities, which we hope serves as a deterrent. At the same time, it provides safe harbor provisions so those who are nearby can help by calling for assistance for someone who may be in distress. One of my favorite things to do is visit with students and talk with them about government, politics and their priorities. 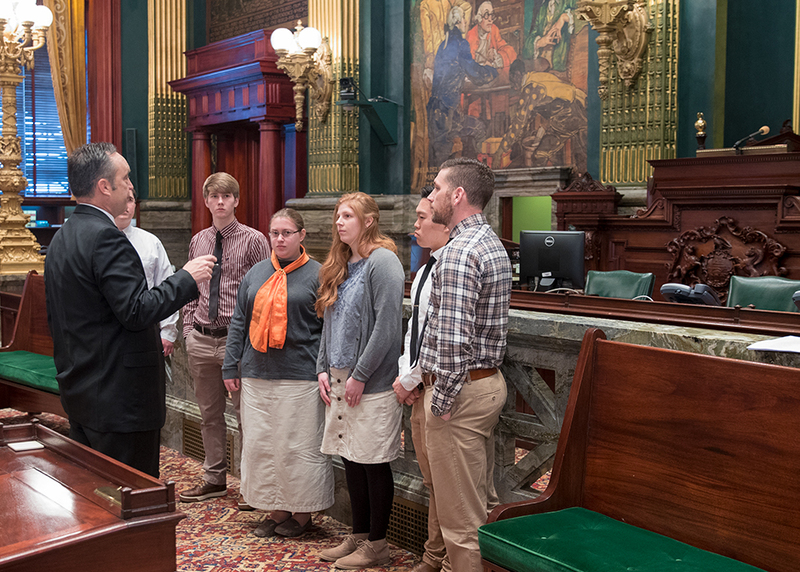 This week, I was pleased to be joined by both the government class from Mifflin County Christian Academy and the politics department from Juniata College at the State Capitol. These students are the leaders of tomorrow. It’s great to see how engaged they are in learning about how government works and making a difference. The Bellefonte Art Museum has been awarded a $50,000 “Marketing to Attract Tourists” grant from the Pennsylvania Department of Community and Economic Development. The museum, which is housed in Bellefonte’s Historic Linn House, will use the funding to complete its porch and four-season room restoration project to better accommodate more visitors, improve safety, enhance the facility and restore areas that currently cannot be used because of age and disrepair. The preserved porches will help the building retain its architectural integrity and will dramatically increase the usable space in the museum and accommodate outside activities. The project will also enable the museum to address safety concerns, including railing heights that do not meet code and rotted and loose floors and railings. The grant funds will be used to re-point brickwork on the ground level wall, restore and rebuild the currently unused four-season room, add electricity and outlets, and replace rotted decking with yellow pine deck boards. The museum attracts many visitors and these repairs will make it and the arts more accessible to all members of our community. This is an investment that promotes tourism and the arts here in Centre County while ensuring this wonderful historic and popular landmark is preserved for future generations to use and enjoy. The school shooting in Florida has prompted school districts in Pennsylvania to re-examine, update and strengthen their security plans to better protect students, including identifying potential weaknesses in their current plans. However, if made public, this information could compromise school safety efforts and put students at risk. While I strongly support transparency, it makes no sense to give someone who intends to commit an act of violence against our schools access to the plans being adopted to prevent a tragedy. We want our schools to be safe and to work with local and state law enforcement to develop comprehensive safety plans. We want them to do so without compromising safety. By allowing this discussion to happen during Executive Session, the safety and security measures determined by our school boards will be protected. This measure balances openness and transparency with our desire to safeguard our children while they are at school. This sensible approach will help our school districts, local governments and first responders as they develop new school safety plans and procedures that will hopefully become national models. The DEA’s Take Back Day provides an opportunity for Americans to prevent drug addiction and overdose deaths. Check the official National Prescription Drug Take Back Day to find the closest location where you can safely dispose of old prescription drugs between 10 a.m. and 2 p.m. Saturday.